The Steelseries SRW-S1 is Steelseries’ latest controller designed for Simraceway, a racing simulation game for the PC aswell as other PC racing games. Co-developed by the creators of Simraceway, I would imagine its main purpose would be to simply work best with that game. STAY IN CONTROL – Everything you need, from brake balance controls to assist setting dials, are always in reach. IN YOUR HANDS – The wheel’s unique design means you can take it everywhere and use it anywhere. There are no pedal sets or bulky seats. FULL RANGE -You can experience full-range acceleration and braking on the back of the S1 Wheel. PLUG-AND-RACE – Plug it in. Choose your game. Play. Sure, you can customize every button, but only if you want to. GET A GRIP – The rubberized wheel grips have an ergonomic shape that allows you to keep a comfortable grasp to steer as you move around the controller. WHERE TO? – Everywhere. The Simraceway® S1 Steering Wheel can be used with all PC racing games including: iRacing, F1 2011Simraceway®, GTR, Live for Speed, DiRT, DiRT 2, GTR 2, Test Drive Unlimited, Need for Speed Shift, Need for Speed III: Hot Pursuit, Need For Speed Underground, Midnight Club 3 Dub Edition and Blur. 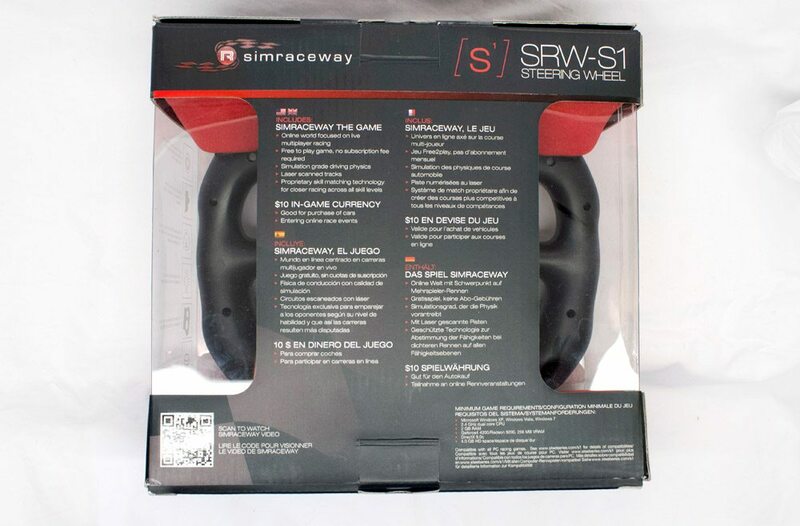 USED BY THE PROS – The SRW-S1 Steering Wheel has been tested and approved by professional racing drivers including four-time IndyCar Series winner, Dario Franchitti and double Indy 500 Champion, the late, great and much missed, Dan Wheldon as well as SimRacing stars, David Greco and Bruno Marques. The Steelseries SRW-S1 comes in vibrant packaging with a nice large window which gives you a good look at what you’ve bought. 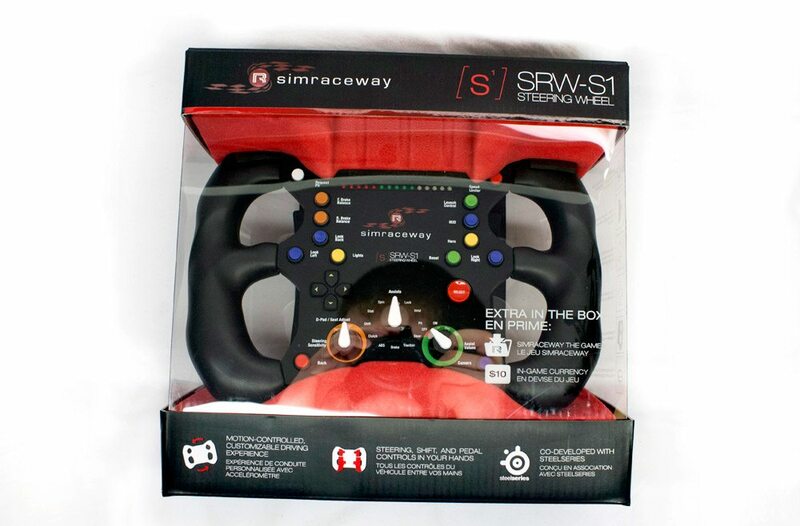 The rear of the box talks about Simraceway the game instead of the actual steering wheel. The bundle is pretty small. 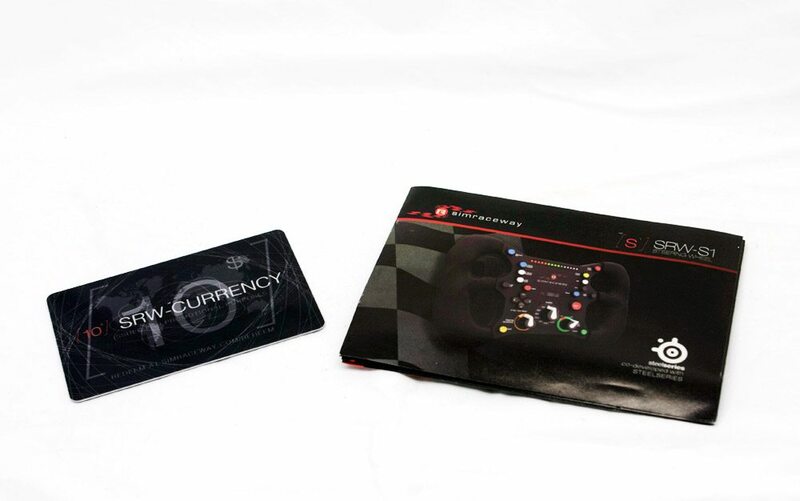 $10 of Simraceway currency which is nice to see as if you’re buying this wheel, it will most likely be for Simraceway and a manual.